The Arakan Rohingya Salvation Army (ARSA) also known as Harakah al-Yaqin (meaning Faith Movement) is a Rohingya militant group active in northern Rakhine State, Myanmar. In this article, we will have a brief look on the ARSA issue. According to a report by the International Crisis Group, it is led by Ataullah abu Ammar Jununi, a Rohingya man who was born in Karachi, Pakistan, and grew up in Mecca, Saudi Arabia. It was established in 2013 following the 2012 Rakhine state riots. According to a former member of ARSA, Ataullah approached villagers, asking for five to ten recruits to join his group and telling them that the time had come to "stop the mistreatment of the Rohingya people". It is estimated that ARSA has a strength of around 200 soldiers. The numbers were even higher initially but have dropped down. ARSA is active on social media and has a twitter account as well. Myanmar's Anti-Terrorism Central Committee declared ARSA a terrorist group on 25 August 2017. According to Indian Sources, Pakistan's intelligence agency has been providing huge monetary support to ARSA and the ISI and some Lashkar terrorists are have also been reportedly involved in training ARSA militants and providing logistics support. According to sources in Assam Rifles, the ARSA terrorists are looking to build terror camps on the Myanmar side of the India border. 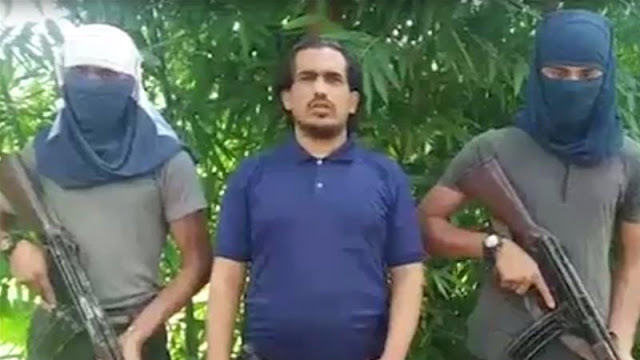 In an online video, ARSA leader said, "Our primary objective under ARSA is to liberate our people from the dehumanising oppression perpetrated by all successive Burmese regimes". ARSA calls itself an ethno-nationalist group rather than a Jihadi group. ARSA also says that it is a secular group rather than an Islamic group but the truth is that ARSA follows many traditional Islamic practices. Unlike other militant/insurgent groups in Myanmar which are organised like a paramilitary with proper ranks, uniforms etc., ARSA is more of an 'amateur' kind of a militant group. The militants are often seen in civilian clothes and are ill-equipped. ARSA uses a very different tactic of attack. The militants cross the border to launch small scale attacks and then retreat back across the border to a community that shares a similar ethnic and/or religious background. ARSA regularly releases press statements online to its Twitter account. Unlike other insurgent groups in Myanmar, most of ARSA's written statements are in English rather than in the group's native language. In October 2016, ARSA claimed responsibility for attacks on Burmese border posts along the Bangladesh-Myanmar border, which killed 9 officers and 4 soldiers. On 25 August 2017, the group claimed responsibility for coordinated attacks on police posts and an attempted raid on an army base. 77 Rohingya insurgents and 12 security forces in northern town of Maungdaw were killed. ARSA claimed responsibility for an ambush carried out on 5 January 2018 in the village of Turaing, which reportedly injured six members of Myanmar's security forces and a civilian driver. On Jul 26, 2018, ARSA attacked a patrol team of Assam Rifles on the Indo-Myanmar border.